SINCE 1851, WE'VE HONORED OUR TRADITION OF QUALITY. IF YOU'RE NOT SATISFIED FOR ANY REASON, PLEASE LET US KNOW. WE PROMISE WE'LL MAKE IT RIGHT. From generation to generation, Pioneer® has consistently produced products with superior taste and the most wholesome ingredients. We're proud of our rich tradition of quality and the people who make it all happen. Read below to see why we stand behind and guarantee everything we make – and how we'll do our best to always make it right through the Pioneer® Promise. We value all of our customers and love to hear from you. Contact us below and tell us how we're doing. If, for any reason, your Pioneer® Gravy Mix did not meet your expectations we'd love to help you find a flavor you like. With over 10 varieties to choose from, there's sure to be one for you. 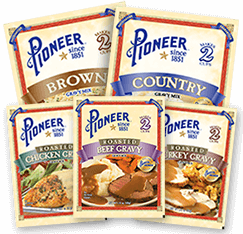 Please request a printable coupon for One Free Package of Pioneer® Gravy Mix good for any flavor you choose. 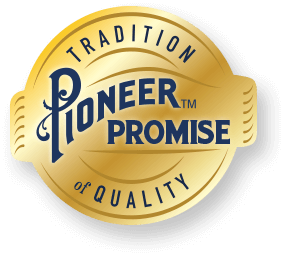 Pioneer has delivered high-quality products, exceptional flavors and our "just baked from scratch" taste for more than 165 years. We continue to be a leading supplier of gravies and sauces, baking mixes, as well as other value-added food products for foodservice and to consumer markets in North America and Europe. 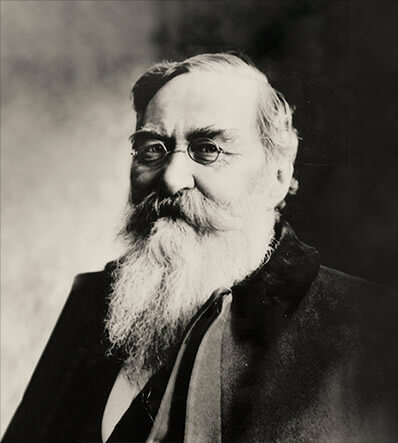 Oldest family-owned business in Texas and the oldest continuously operated family owned milling company in the U.S.
At Pioneer, we're continuously driven by our commitment to the heritage, independence and family spirit of our founder, Charles Hilmar Guenther. When you meet the men and women of C.H. Guenther & Son, Inc., Pioneer's parent company, you meet over 165 years of family pride and tradition. Over the decades we're retained our pioneer spirit. Our plants and offices have remained in the same communities. And, even though our workforce has certainly grown since those early days, we've preserved the solid values and culture that has been with us from the start. We will demonstrate high integrity, a commitment to excellence, & a positive attitude in all that we do. We are results-driven, lead by example, communicate openly & honestly, value diversity, & foster long-term relationships. We will consistently provide products & services that meet or exceed our customer's expectations, through the people & processes that we employ. We are committed to the growth of C.H. Guenther and the preservation of its heritage, independence, & family ownership. If you have any questions or comments about our products or our company, or just want to tell us how we're doing, contact us via email through our C.H. Guenther & Son, Inc. Corporate Website or by telephone at 1 (800) 531-7912. © Copyright 2017 C.H. Guenther & Son, Inc. All Rights Reserved.